Central Asian nations must supersede historic economic ties with Russia both by fostering employment and investment links elsewhere, and by generating a meaningful internal economy. 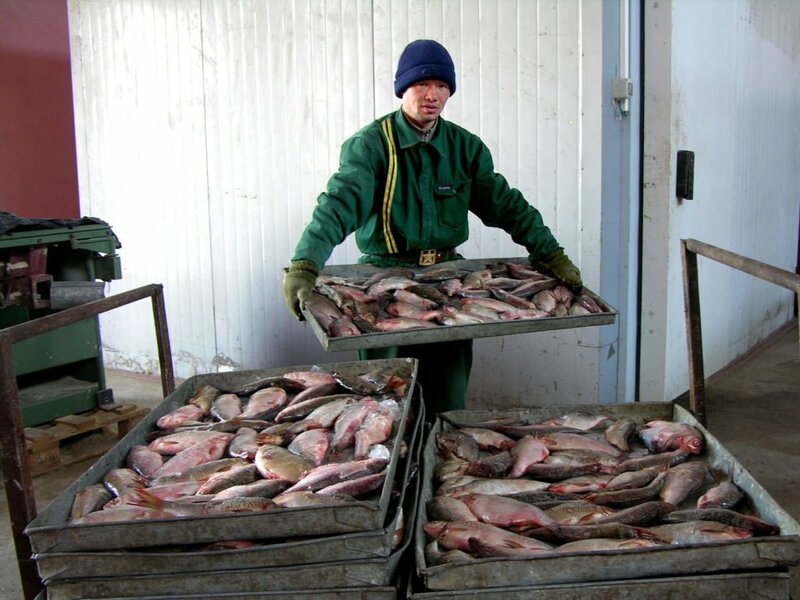 A work­er moves fish at a pro­cessing plant in Aral­sk, Kaza­kh­stan. The eco­nom­ies of Uzbek­istan, Tajikistan, and Kyrgyz­stan are heav­ily depend­ent on remit­tances from migrant labour­ers in Rus­sia. Tajikistan is the most remit­tance-depend­ent coun­try in the world, with four in ten adult males seek­ing employ­ment abroad. The increased move­ment of people across post-Soviet Euras­ia echoes the his­tor­ic­al con­nectiv­ity and cross-cul­tur­al inter­ac­tions with­in the region. These young work­ers have found employ­ment in low-income jobs indus­tries such as con­struc­tion sites and nat­ur­al resource extrac­tion. Accord­ing to the World Bank, remit­tance inflows in Tajikistan rep­res­en­ted 42% of the country’s GDP in 2014. At an indi­vidu­al level, remit­tances sup­port the daily sub­sist­ence of poor fam­il­ies, and act as a medi­um for domest­ic con­sump­tion. In turn, this improves the bal­ance of pay­ments by provid­ing gov­ern­ments with tax from goods pur­chased through remit­tances. How­ever, remit­tances to Cent­ral Asia have begun to dimin­ish. The above fig­ures demon­strate the decline of remit­tances from Rus­sia to Cent­ral Asia. This fall is linked to devel­op­ments in the glob­al eco­nomy. The glob­al plunge in oil prices has caused a slump in the Rus­si­an eco­nomy, trig­ger­ing a reces­sion. West­ern sanc­tions imposed after Moscow’s annex­a­tion of Crimea has fur­ther com­poun­ded the eco­nom­ic crisis. These two devel­op­ments have res­ul­ted in a devalu­ation of the Rouble and thus the value in dol­lars of remit­tances. The weak­ness of the rouble has res­ul­ted in the fall­ing of real wages in Rus­sia. Eco­nom­ic deteri­or­a­tion in Rus­sia has, in turn, lowered demand for Cent­ral Asia labour, for­cing migrant work­ers to return home. Moreover, migrant work­ers from Tajikistan and Uzbek­istan face tough­er immig­ra­tion laws as the two coun­tries do not belong to the Euras­i­an Eco­nom­ic Uni­on. This phe­nomen­on has also affected migrant work­ers from the Cau­cas­us. It will be inter­est­ing to see if the lack of employ­ment oppor­tun­it­ies in Rus­sia pre­cip­it­ates a flow of migra­tion to oth­er coun­tries in Europe or Asia. Bey­ond Russia’s eco­nom­ic trav­ails, a remit­tance-depend­ant eco­nomy sig­nals low levels of invest­ment (and thus a lack of pro­duct­ive non-primary jobs), declin­ing terms of trade, and per­sist­ent vul­ner­ab­il­ity to the vicis­situdes of the glob­al eco­nom­ic cli­mate. Moreover, the iter­at­ive waves of emig­ra­tion serve to under­mine the fra­gile nation­al con­scious­ness in nas­cent demo­cra­cies and cause a vari­ety of social frac­tures as a con­sequence of wide­spread absent­ee­ism. Hence there is a need both to move away from Rus­si­an depend­ence, and the remit­tance eco­nomy itself. The struc­tur­al over-reli­ance on remit­tances have cre­ated an eco­nom­ic dilemma for Cent­ral Asi­an gov­ern­ments. Lower remit­tances have engendered a fall in eco­nom­ic growth as the pur­chas­ing power of cit­izens dimin­ish. Tak­ing into account the excess­ive debt affect­ing these coun­tries, gov­ern­ments are forced to increase spend­ing, thereby exacer­bat­ing fisc­al defi­cits. How­ever, the com­bin­a­tion of estab­lished migrant com­munit­ies from Cent­ral Asia in Rus­sia and the ease of assim­il­a­tion via a shared lan­guage act as recal­cit­rant bar­ri­ers to swift trans­itions in the nature of Cent­ral Asi­an remit­tance eco­nom­ies. Clearly, these coun­tries must seek altern­at­ive solu­tions and diver­si­fy their eco­nom­ies. Increased for­eign dir­ect invest­ment (FDI) from China and Tur­key high­light the geo­pol­it­ic­al shifts occur­ring in the region. Increased invest­ment in infra­struc­ture will reduce the depend­ency on remit­tances and stim­u­late the employ­ment mar­ket in a region that offers cheap­er labour than its neigh­bours. The pur­suit of altern­at­ive cur­rency inflows sig­nals a region will­ing to adapt and evolve to changes in the glob­al eco­nomy. China is cur­rently the largest investor in the region. Its Silk Road Eco­nom­ic Belt (SREB), estab­lished in 2013, offers an altern­at­ive to eco­nom­ic strategies ori­ented towards Rus­sia. Like­wise, the Beijing-led Asi­an Infra­struc­ture Invest­ment Bank rep­res­ents a nov­el source of fund­ing for eco­nom­ic devel­op­ment and infra­struc­ture-build­ing in Cent­ral Asi­an states. As Cent­ral Asia re-ori­ents itself in the glob­al eco­nomy, it is faced by a pleth­ora of oppor­tun­it­ies, chal­lenges, and poten­tial traps. Will lead­ers look bey­ond Moscow and seek friend­ship else­where?